Upper Falls and Portage (Erie R.R.) 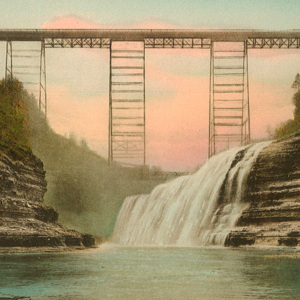 Bridge, Letchworth State Park, N.Y.
Hand-colored postcard shows the iconic iron viaduct built in 1875 after a fire destroyed the original wooden bridge earlier that year. 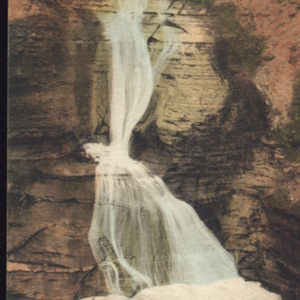 Upper Falls, Letchworth State Park, N.Y.
Hand-colored postcard depicts the Upper Falls of Genese River near Portage. Usually shown with the Erie Railroad bridge, this view focuses upon the falls themselves, looking downstream. Middle Falls, Letchworth State Park, N.Y.
Focal point of Glen Iris area features Erie Canal viaduct in background. 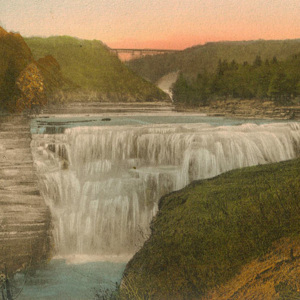 Photograph is notable for the Middle Falls Overlook, visible at the right side of falls, indicating a date prior to 1915. 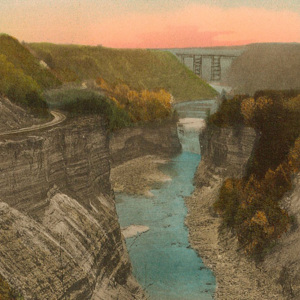 Portage Bridge from Inspiration Point, Letchworth State Park, N.Y.
Hand-colored postcard shows Genesee River Gorge from Inspiration Point, also featuring at left the Genesee Valley Canal and in the distance the Erie Railroad's Portage viaduct. The Lower Falls in Letchworth State Park, New York. 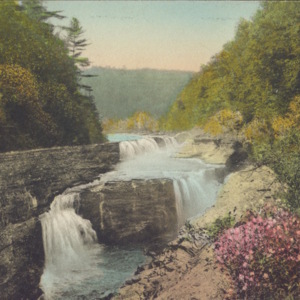 Handcolored illustration of The Lower Falls appears on the front of the postcard, accompanied by a message on the back, "I didn't see these flowers but I guess they do grow here." 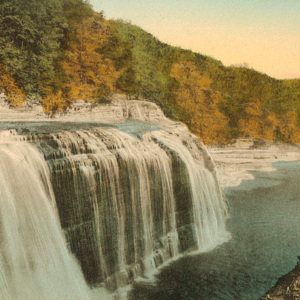 Postcard: Wolf Creek at Letchworth State Park, New York. 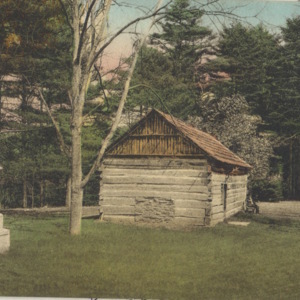 Handcolored illustration of Wolf Creek appears on the front of the postcard, accompanied by a unused back. The Museum in Letchworth State Park, New York. 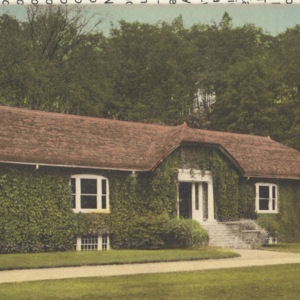 Handcolored postcard of The Museum appears on the front of the postcard, accompanied by a unused back. Glen Iris Inn. Letchworth State Park, New York. 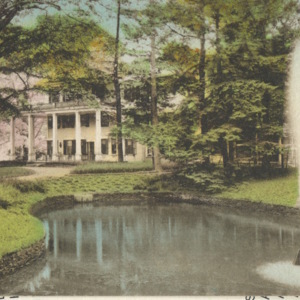 Handcolored postcard of The Glen Iris Inn appears on the front of the postcard, accompanied by a unused back. Upper Falls and Portage (Erie R.R) Bridge. Letchworth State Park, New York. 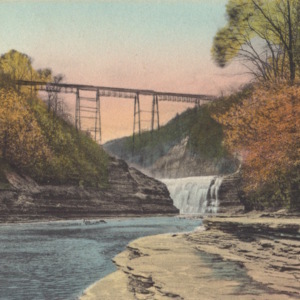 Handcolored postcard of Upper Fall and Portage Bridge appears on the front of the postcard, accompanied by an unused back. Statue and Council House located in Letchworth State Park, New York. Handcolored postcard of Mary Jemison Statue and the Council House appear on the front of the postcard, accompanied by unused back.